For much of the past century, there have been three constants during the Thanksgiving holiday: turkey, football and the Macy’s Thanksgiving Day Parade. This year marks the 86th edition of the parade, which draws an estimated 65 million television viewers every November. This year, the North Carolina A&T marching band, The Blue and Gold Marching Machine, will high step through the streets of Manhattan and into the homes of viewers around the nation and the world. Though the band is one of the most widely-recognized in the world of historically Black colleges and universities, Thursday will mark their first appearance in the Macy’s Parade. They will also be the first HBCU band from the state of North Carolina to participate in the parade. The Marching Machine’s selection for the parade was years in the making. Band director Dr. Kenneth Ruff said the band’s selection is something he has been working toward for quite some time. 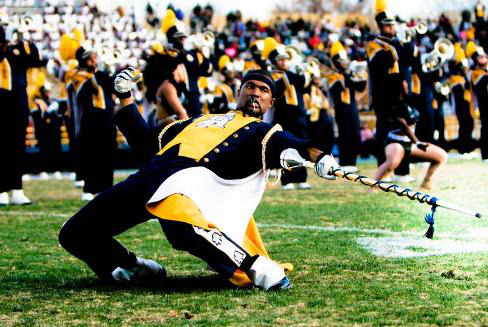 Dr. Ruff applied for the parade in 2007, and A&T made it to the waiting list but was ultimately not selected. He applied again in 2010, and was overjoyed when informed that his squad was one of just 11 out of 150 applicants selected to perform. Ruff beamed with pride on the sidelines as he watched his band prepare to perform at halftime of a football game against rival North Carolina A&T. As a former member of the Blue and Gold Marching Machine, the band’s selection is a personal dream come true for Ruff. Ruff said the band will play a special selection called “Harold Square Melody,” composed just for the occasion as the Marching Machine marches the 2.3-mile parade route. While Dr. Ruff recognized the band’s appearance is a big moment for the university and the city of Greensboro, he also realizes the Marching Machine will have to carry the banner for HBCUs. 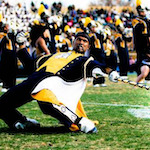 As the only HBCU band in this year’s parade, Ruff feels the spotlight will be on his group, especially in light of some of the recent image issues many HBCU bands have had involving hazing and other infractions. Though they have been putting in five hours of practice time in preparation for their parade performance, the Marching Machine’s New York excursion won’t simply consist of hard work. Since learning of their selection in the spring of 2011, the band has raised over $450,000 so that 250 band members and 300 people total could have a memorable trip. Clarinet player Kiana Staton is one of several band members who have never been to New York. The Fayetteville, N.C. native admitted she was a little nervous about the performance, especially since she will be near the front when the Marching Machine steps onto the parade logo for one minute in the television spotlight and in front of a crowd estimated at over 3.5 million. “It’s nerve-wracking, but I feel like when I get there, I’ll be okay. I’m kind of nervous because there are going to be millions of people out there,” she said. “We’ve been working really hard to get to Macy’s and raise the money for it, so I’m really excited. Trombone player Todji Dozier is another band member who will head to New York for the first time when the band’s bus leaves campus early Wednesday morning. The senior agricultural design major’s excitement was written all over her face.